What does it mean to be a homemaker? Is it something that’s too old fashioned or outdated for the modern day Christian woman? Is it something that is not as important as the “real” work of the world? I don’t think so. I think that there is much more value in homemaking than the world realizes, and often times more than I realize myself on any given day. We can lose sight of the bigger picture when we’re nose-down in our work week in and week out. Today, let’s take a wider view. 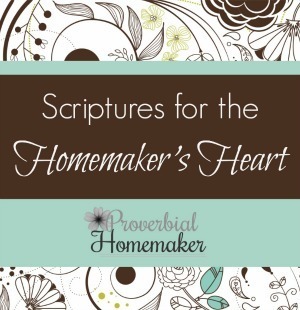 Women of many different ages and stages of life are called to be a homemaker. As a mom and wife, I am certainly called to it! For me, being a homemaker means cultivating a home that is centered on Jesus Christ, on love, and on nurturing and growing together. It’s a vision thing and it’s a daily grind thing. 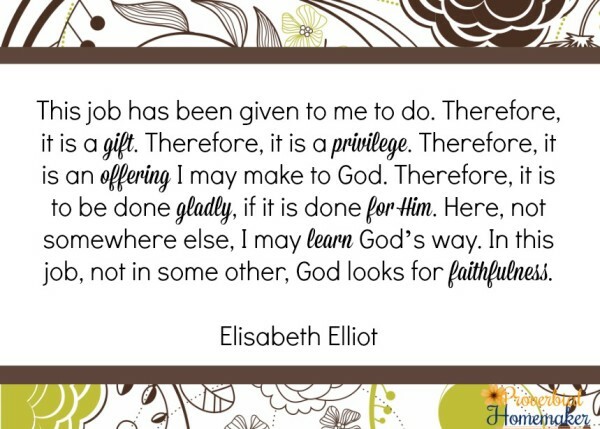 When we set our vision on what God has for us in our homemaking, our work is given new life. We begin to enjoy our tasks even more as a labor of love for the Lord. Let us invite the Holy Spirit to make His home in our homemaking, just as He has made His home in our hearts. I have been praying a selection of scriptures over my day and my homemaking efforts each morning before little feet hit the floor. This singular effort has made a huge difference for me! I am more often reminded throughout the day that I am serving the Lord as I clean out the sink, and that I am co-creating a safe place for hearts as I serve meals and teach phonics. Ladies, our homemaking is the environment of godly marriages, family discipleship, and generous hospitality. These are not small things. They are the sweet aroma of grace surrounding our lives and our families. It isn’t perfect, nor should it be, but it IS important. 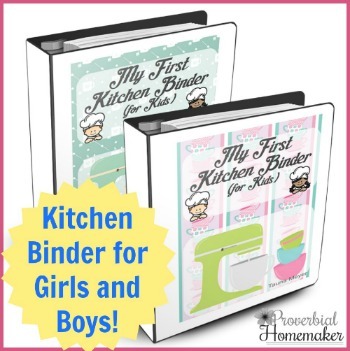 In invite you to join me in this vision for our homemaking! I’ve put together some free printable scripture cards and art prints that you can use in your home. I hope you are blessed by it! 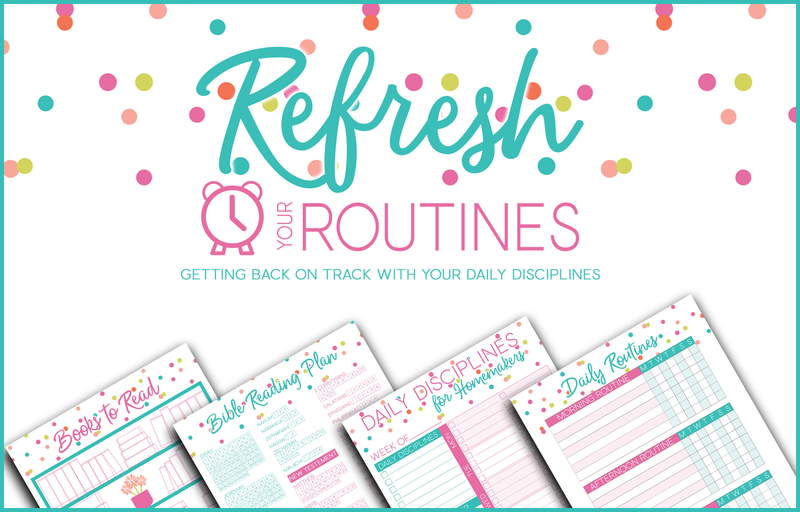 FREE Refresh Your Routines Kit for homemakers with video lessons and printables! 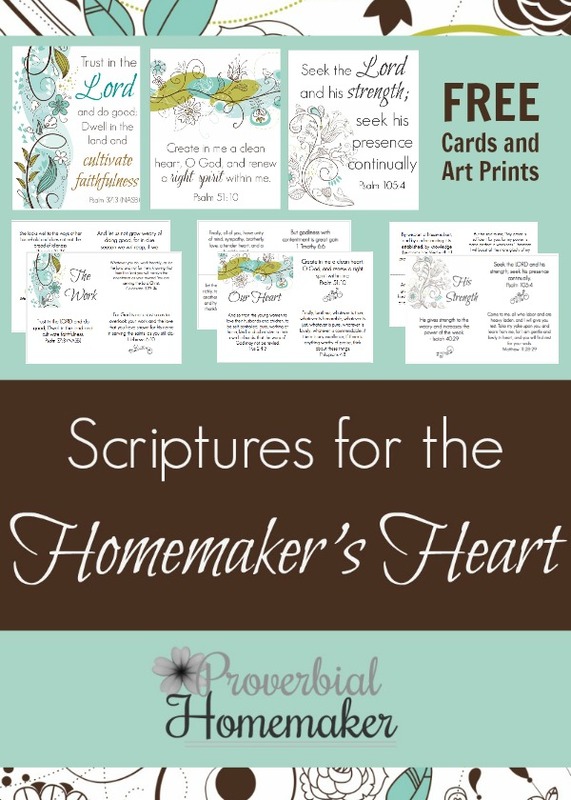 I love these verse homemaking verse cards! Thank you, Tauna. May God bless you. Tauna, there are so many Christian and blogging resources dedicated to the stay-at-home mom… I work part time and think, with your blog, that you do, too. 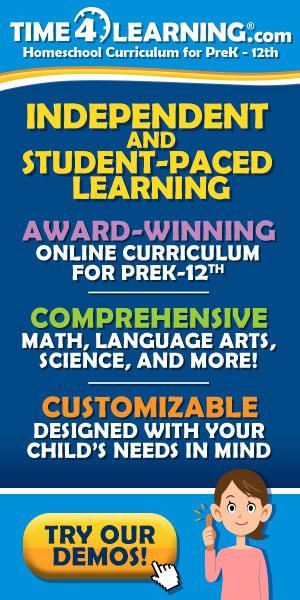 That’s in addition to homeschooling my kids. I’d love to see a post that encourages moms who work – whether out of need or desire. It is all the Lord’s call, whatever that is, right? Your comment made me think of some friends who have specifically blogged about balancing work and home life, whether they work in or outside the home. It’s an important topic! I’ll consider whether I have something valuable to add to that or perhaps do a roundup of their excellent and encouraging posts. These printables are absolutely BEAUTIFUL. And I can tell the verses are going to be very encouraging to me. 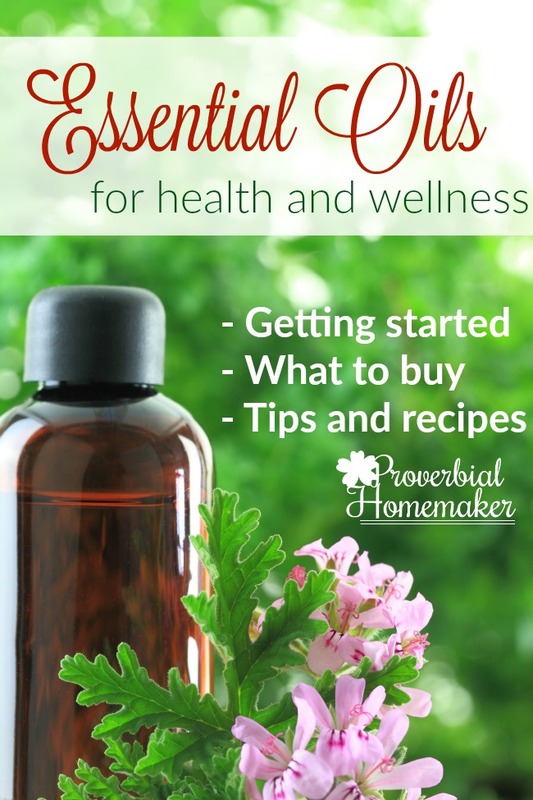 Thanks so much for providing this resource! I’m so glad Ann! 🙂 I hope they do encourage you! It’s all beautiful thank you…God bless you! I’m so glad these are encouraging to you, April!